Observed on a landscape shrub native to South America, Pigeon Berry, near Eldoret, Kenya. July 2014. All True Bugs such as Leaf-footed Bugs have specialized mouthparts for taking liquified food. With sharp stylettes they pierce straight into tissue and with a powerful pump remove fluid. Leaf-footed bugs focus their feeding activity on fruits and developing seeds. This feeding often causes the seeds to be infertile or to become infected with bacteria or molds. If the host is a crop for food, the farmer is not happy of course. But in the case shown here the bug is feeding on fruits of a landscape plant that have no economic value. 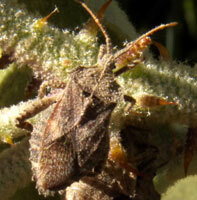 Many leaf-footed bug species (there are many) have a flared leaf-like process on the third pair of legs. In some species only the male has the leaf-foot. This species breaks the trend in that both male and female lack the characteristic leaf on the enlarged legs. 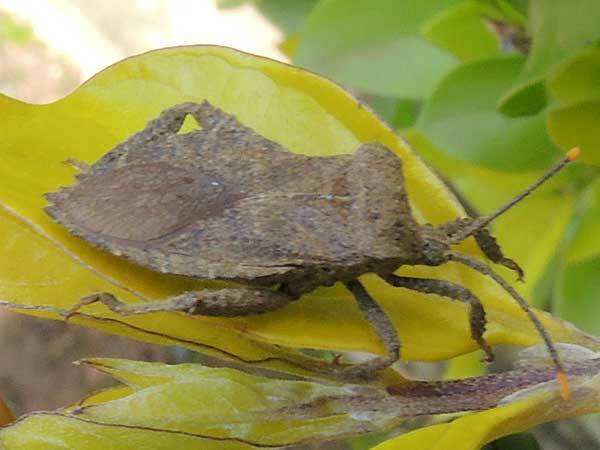 This bug has a body texture that resembles the plant stems that it was feeding on suggesting that it uses crypsis to hide. Many coreids can also spray a noxious fluid in defense if attacked.